Do you sometimes wonder if the time and money you invest into fairs and expositions is justified? Deb, a former provider of Chamber of Commerce trade show training, will teach your team how to see the results of the time and effort invested at fairs and expos! The Explode Expo Results seminar teaches you and your organization how to get the most from the investment into fairs and expos. Fairs and expositions bring new customers into your home business that are totally unrelated to your existing client base. All good businesses take advantage of every available opportunity to strengthen their customer foundation. I love the Ten Second Rule and qualifying the leads. 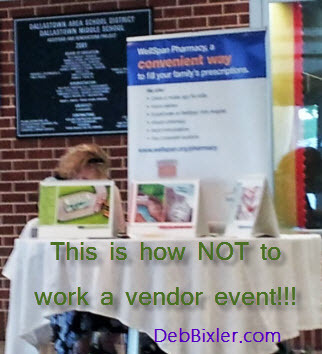 I have done so many vendor events in the past and would come home with TONS of unqualified leads, so your tips are making my vendor events and follow-up all that more productive! Thanks for that! The leads that you meet at a fair or expo will give you or your sales organization a solid business. Deb Bixler teaches home based business systems that work! Whether your business is retail, service-oriented, industrial or technical, these are simple expo lead generation systems that will work for any type of business. Your fair or expo experience does not have to be a high-class expensive booth set up. How To Find The Best Events For You! How To Set Up An Effective Booth! Maximize your efforts at fairs and vendor events by inviting Deb to provide your team with professional trade show training!